Several months after Dubois assumed his new office as State Auditor, Mr. Lincoln wrote Dubois about the conduct of the state banking commissioners in enforcing banking laws. He was irritated that he did not understand laws: “Several persons here keep teasing me about you and the Bank commissioners not enforcing the banking laws. In my stupidity, I do not believe I quite understand what the ground of complaint is; but it appears to me to be this; that the stocks which the banks have on deposite have depreciated; that in such case, it is your duty to make the banks deposite additional stocks, or, in default, wind them up; and that you do not perform this duty. Now how is this? Write me plainly enough to make me understand; and write soon too, for I am annoyed about it a good deal. Your friend as ever.”5 Two years later, Mr. Lincoln’s understanding of the state’s financing seem to have improved and Mr. Lincoln wrote Dubois, Governor Richard Yates and State Treasurer James Miller a long letter about state bonds. Dubois was repeatedly disappointed by the President’s failure to appoint him to a patronage position; the President also refused to assist Dubois’ attempt to get the Republican gubernatorial nomination in 1864. Dubois lost the nomination to Richard Oglesby. 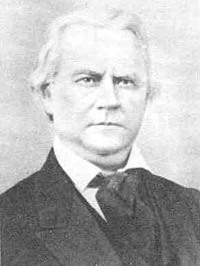 The state auditor did not run for reelection in 1864 and was succeeded by his chief clerk, Orlin H. Miner. Dubois also hoped to get the post of Secretary of the Interior that went in 1865 instead to James Harlan. Poet Walt Whitman may not be the most objective observer of the contest between Dubois and Harlan. Whitman had no inside sources in the White House and was ousted as a clerk at the Interior Department shortly after Harlan took over – so he may only have access to office scuttlebutt. But Whitman later wrote that “the choise was very close between Mr. Harlan and Col. Jesse K. Dubois of Illinois. The latter had many friends. He was competent, he was honest, and he was a man.” Whitman wrote that “The reason for appointing Co. Dubois were very strong, almost insuperable” but Harlan’s Methodist connections prevailed.14 Harlan’s daughter would wed Lincoln’s son. Alonzo Rothschild, Lincoln, Master of Men: A Study in Character, p. 59. Henry C. Whitney, Life on the Circuit, p. 77-78. Douglas L. Wilson and Rodney O. Davis, editor, Herndon’s Informants, p. 718-719 (William H. Herndon interview with Jesse K. Dubois, December 1, 1888). Rufus Rockwell Wilson, editor, Lincoln Among His Friends: A Sheaf of Intimate Memories, p. 97 (Fred T. Dubois, New York Tribune, February 12, 1927). Roy P. Basler, editor, The Collected Works of Abraham Lincoln, Volume II, p. 414 (Letter to Jesse K. Dubois, September 13, 1857). Douglas L. Wilson and Rodney O. Davis, editor, Herndon’s Informants, p. 441-442 (William H. Herndon interview with Jesse K. Dubois, ca. 1865-1866). Roy P. Basler, editor, The Collected Works of Abraham Lincoln, Volume III, (Letter from Ozias M. Hatch, Abraham Lincoln and Jesse K. Dubois to Newton Bateman, November 20, 1858). Abraham Lincoln Papers at the Library of Congress. Transcribed and Annotated by the Lincoln Studies Center, Knox College. Galesburg, Illinois. (Telegram from Jesse K Dubois and David Davis, May 15, 1860). Abraham Lincoln Papers at the Library of Congress. Transcribed and Annotated by the Lincoln Studies Center, Knox College. Galesburg, Illinois. (Telegram from Jesse K Dubois, May 14, 1860). Rufus Rockwell Wilson, editor, Intimate Memories of Lincoln, p. 323 (Samuel R. Weed, New York Times, February 14, 1932). Paul Simon, Lincoln’s Preparation for Greatness, p. 294. Michael Burlingame, Abraham Lincoln: A Life, Volume II, p. 85. Abraham Lincoln Papers at the Library of Congress. Transcribed and Annotated by the Lincoln Studies Center, Knox College. Galesburg, Illinois (Letter from Jesse K. Dubois to Abraham Lincoln, Wednesday, March 27, 1861). William E. Barton, Abraham Lincoln and Walt Whitman, p. 115-116. Michael Burlingame, editor, With Lincoln in the White House: Letters, Memoranda, and Other Writings of John G. Nicolay, 1860-1865, p. 198. Douglas L. Wilson and Rodney O. Davis, editor, Herndon’s Informants, p. 442 (Jesse Dubois interview with William H. Herndon, ca 1865-1866). Douglas L. Wilson and Rodney O. Davis, editor, Herndon’s Informants, p. 620 (Letter from Jesse K. Dubois to Henry C. Whitney, April 6, 1865). Mark A. Plummer, Richard J. Oglesby, Lincoln’s Rail-Splitter, p. 94. Michael Burlingame, The Inner World of Abraham Lincoln, p. 284. Justin G. Turner and Linda Levitt Turner, editor, Mary Todd Lincoln: Her Life and Letters, p. 55 (Letter from Mary Todd Lincoln to Hannah Shearer, April 24, 1859). Thomas F. Schwartz and Kim M. Bauer, “Unpublished Mary Todd Lincoln”, Journal of the Abraham Lincoln Association, Summer 1996, p. 15 (Letter from Mary Todd Lincoln to Jesse Kilgore Dubois, July 26, 1868). Douglas L. Wilson and Rodney O. Davis, editor, Herndon’s Informants, p. 692 (Jesse Dubois interview with William H. Herndon, ca. 1883-89).